Knowledge to Action: What’s in a Name? Learning is most beneficial when knowledge meets action. Knowledge to Action epitomises our ethos – for education to become a virtuous circle of learning and practise, bringing with it change and development for the benefit of individuals and communities. In Arabic, knowledge and action translate into Ilm and Amal, which provides a fitting name for our initiative. Since 2012, Knowledge to Action has produced a suite of character development educational resources, teacher training programmes and community initiatives that have been implemented by a nationwide network of Muslim faith and supplementary schools across diverse communities. By pioneering values-based education, Knowledge to Action has helped shift the paradigm in Muslim educational institutes, contributing to the delivery of a curriculum that is contextualised and relevant to young Muslims living in Britain. Character Development: An Inside Out Approach. To us, character development means translating good character into social responsibility and ethical dealings that benefits communities. This is what we refer to as an ‘inside out’ approach. Specialise in Character Development Education. We specialise in the research and development of educational resources, training and community initiatives that promote character development. Our framework for character development education focuses on the moral, spiritual, physical, intellectual, cultural, emotional and social development of Muslim learners in Britain. Knowledge to Action inspires Muslim learners to become well-rounded in their world-view, confident in their identity, active in their communities and ethical in their dealings. The resources and training we provide enable educators to nurture qualities, values and leadership skills in Muslim learners to give them a sense of purpose and responsibility. Encourage Practical Learning through Community Initiatives. Our approach of learning through practical application is core to our philosophy and is the inspiration behind our name. Allowing learners to enhance life skills and self-confidence, ensures that experiential learning is for the benefit of others through social responsibility initiatives in the community. Muslim Faith and Supplementary Schools. We provide bespoke resources developed by leading strategists, educationalists, scholars and creative professionals. Our character development curriculum spans from KS2-KS4, supported by training programmes that help teachers build their own confidence and bring learning to life in the classroom. Our resources allow parents to deliver character development education in a structured way at home and invite parents to actively participate in their child’s community challenges. Our training programmes help parents take a lead in nurturing the character of their children and equip parents with an understanding of teaching techniques. We place learners at the heart of our continuous research and development so our services are tailored to their needs – age appropriate, relevant and contextualised to the lives of Muslim learners in Britain. Our suite of educational resources has been designed for Muslim learners aged 7-16. Developed by educators for educators, our resources are designed to make the delivery of character education an enjoyable and transformative process. They promote universal values and ethics and encourage open dialogue and discussion. Our curriculum is integrated with the core requirements of the National Curriculum, Ofsted inspection framework and Personal, Social, Health and Economic (PSHE) education. Teachers delivering the Knowledge to Action curriculum can benefit from our regional INSET training programmes which teach practical ways of developing the character of children at home and in the community. Through our advisory service, we support senior leaders seeking to embed a whole school approach to character development education within their institutes. Character development is the key to overcoming socio-economic challenges and building bridges between diverse communities. To make a difference locally, we believe that learners need to be coached and mentored into becoming the leaders and architects of a better future. Knowledge to Action works in partnership with national charities such as The Salvation Army, Age UK and the RSPCA to provide community-based social responsibility opportunities for learners. Inspiring a Sense of Purpose and Responsibility. Through the Knowledge to Action inspired opportunities to engage in civic life, students learn about care, compassion and the rights of humans, animals and the environment. This sense of purpose helps them understand their role as responsible leaders within their communities, growing into well-rounded, confident, active and ethical individuals who love, live and share their faith with others. We believe that educational initiatives focusing on the moral, spiritual, physical, intellectual, cultural, emotional and social development of learners are the right of every child globally. Learners at home benefit from a set of resources which position character development at their heart and transform the dynamics of home education and parenting. Demonstrating the Impact to the Nation’s Wellbeing. By raising levels of confidence and aspiration, Knowledge to Action helps learners from diverse social and economic backgrounds succeed academically and professionally, improving social mobility across the UK. Knowledge to Action facilitates social responsibility activities that nurture good citizenship, civic responsibility, shape future role models and connect different communities, improving social cohesion nationwide. An Implementation Plan that is Tailored to Your Needs. Whether you are a Muslim faith or supplementary school or a parent at home our implementation plan can be scaled according to your needs. Our sales support team are at hand to guide you through choosing the services that fit you best. Building Lasting Relationships through a Range of Services. Reaping the fruits from education can take time, so Knowledge to Action provides capability that goes beyond a one-time transaction. Through our range of services, we build a lasting relationship that extends through the course of an educator’s journey in developing young Muslim learners. Steps to Delivering Character Development. 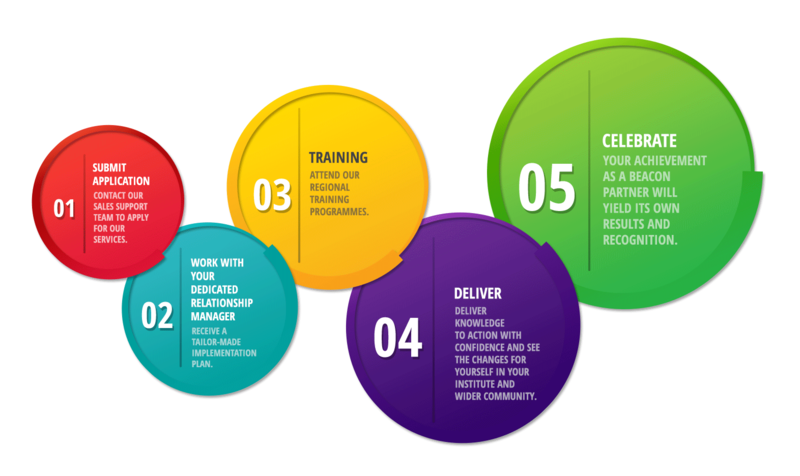 Becoming a Knowledge to Action beacon partner gives you access to a range of services, including consultancy support and advanced training that will transform your delivery of character development education. Our Support Team can be contacted by phone or email and are happy to guide you through every step of the application process. Get in touch today to join a national family of beacon institutes.